I’ve used diluted white vinegar as an all natural cleaner for a long time now; I use it on windows, floors, mirrors, countertops, even on carpet to remove smelly stains. When the vinegar dries it doesn’t leave a vinegary smell, and it’s safe to use around kids and pets. To make my homemade cleaner even more powerful (and to keep it safe) I began making citrus vinegar. The oils in citrus fruit peels act as a degreaser, making cleaning easier AND they smell great! 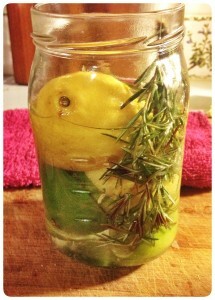 Option: Add a sprig of rosemary in with lemon and lime peels! 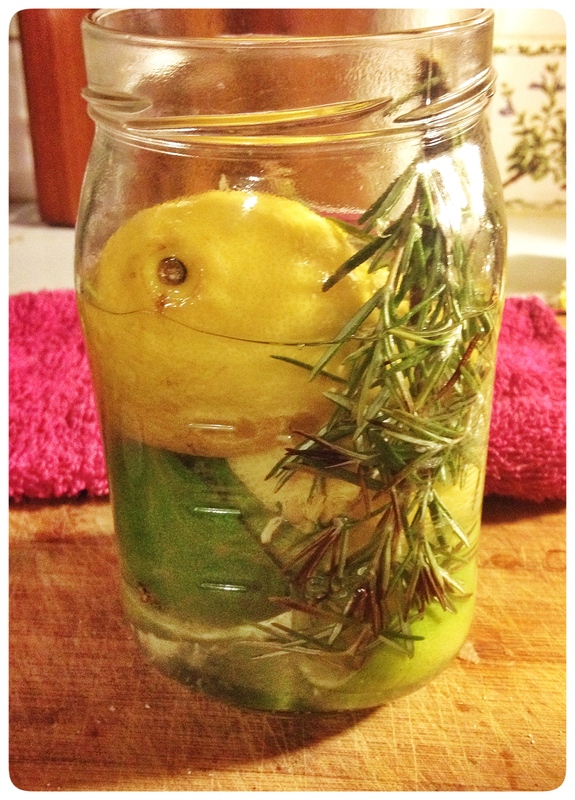 All you need to do is stick some citrus peels (lemon, lime, orange) in a mason jar and cover them in white vinegar. Cover with a lid, and let it sit for 2-4 weeks. When it’s time, remove the peels from the vinegar and discard. Pour your citrus vinegar into a spray bottle and dilute with water; I usually do one part vinegar to one part water. And there you have it. A fresh smelling, strong cleaner that you can safely use in your home.